This is one of our favorite ways to enjoy an Asian flavored meal, with the tropical addition of orange. It’s a light and refreshing meal, but also substantial enough to be filling and satisfying. Slice the bell pepper in thin strips. If the pea pods are small, leave them whole, if they are large, slice on the diagonal in half. Zest one of the oranges, then juice both. Make the sauce by combining the vegetable bouillon, orange juice, zest, soy sauce, cayenne, ginger and cornstarch. Mix well to make a smooth liquid. Add the pepper pieces and begin to saute until soft. Add the onion rings and saute. Add the pea pods and tofu pieces. When the pea pods begin to soften, but are still bright in color and crunchy, add the sauce. Turn down the heat and stir until the sauce is clear and thick. We enjoyed the meal over rice. 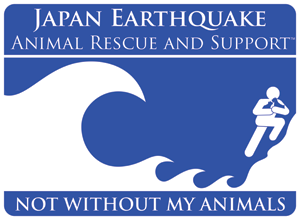 Please consider a donation for Jears, the Japan Earthquake Animal Rescue and Support, a coalition created to positively support rescue efforts for the animals who have been affected by the devastating earthquake that hit Japan March 11, 2011 and its aftermath. 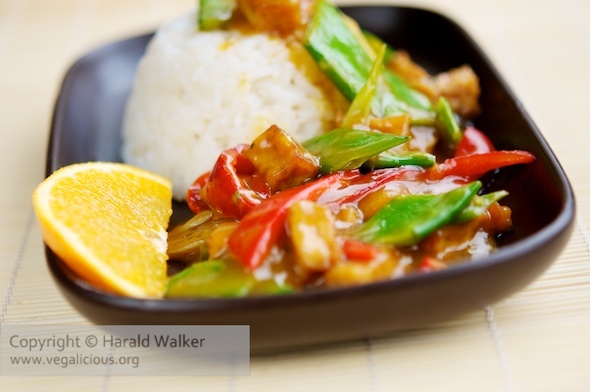 Posted by Chris Walker on March 25, 2011 in Bell Pepper, Main Dishes, Orange, Tofu.